This PDF 1.7 document has been generated by Adobe InDesign CS5.5_J (7.5.3) / Adobe PDF Library 9.9, and has been sent on pdf-archive.com on 24/12/2015 at 15:40, from IP address 5.18.x.x. The current document download page has been viewed 562 times. measures up to 6 systems simultaneously. 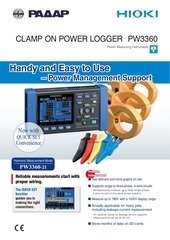 ideal for those requiring greater efficiency in electrical device assessment. 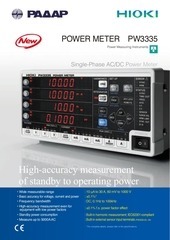 all your power measurement needs. efficiency measurements that are essential to device assessment. measurements and use that information to calculate motor output. HARMONIC / FLICKER MEASUREMENTS UNIT 9605 .
measurement, management and analysis of data. Data can be output to the optional PRINTER UNIT 9604.
time, timer time, and realtime control time). as the 9600 and 9601 which accept direct input of up to 1000V/50A. CT6865, 9709, CT6862 and CT6863. 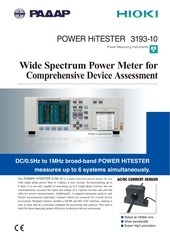 for integrated, all-round device assessment. 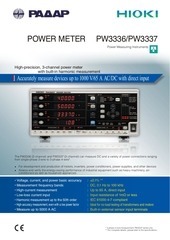 Measure mixed AC and DC components with a single unit. when using the optional 9605 HARMONIC / FLICKER MEASUREMENTS UNIT . parameter can be displayed simultaneously for each of three channels. and power. Displaying only proportion, or two parameters simultaneously, such as amplitude and phase angle, is selectable. switched to D measurement and &quot;Pst&quot; value. for up to three channels can be displayed at the same time. for each harmonic, making clear the voltage-current phase relationship. of harmonic wave for each of voltage, current and power. Select from time average, moving average and exponential average. measurement of fundamental waveforms and carrier waveforms of inverters. Three efficiency calculations can be obtained simultaneously from measured voltage values. data compatibility with previous instruments. measurement with 10-times improved sensitivity for current ranges. Please ask for detailed specs. 9601 and 9602 each have assured ranges for input frequency. characteristics. 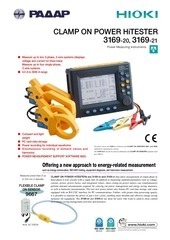 See page 8 for details on the clamp-on sensor specifications. Note 2: Assured accuracy ranges for combined mode measurement are 10 Hz or greater for the AC mode, and DC only for the AC+DC mode or DC mode. Note 1: The above calculation algorithm is for a single phase, 2 wire input to ch 1, and 3 phase, 3 wire input to ch 1/2/3 (3 voltage, 3 current). and when there is no symbol, it lags. &quot;su&quot; is &quot;-&quot; when the sum of reactive power is negative and &quot;+&quot; (but unsigned) when it is positive. power factor, phase, frequency, current/power integration, load rate, efficiency. Voltage, torque, r/min, frequency, motor output. Harmonic, waveform, voltage fluctuation / flicker measurement function. At 0.1% to 130% of all other ranges. All range is zero suppressed at less than lower % value. selected, its not possible to switch between them. Display update rate : 8 times/sec. sum value is max. ±3dgt. Maximum rated power : 150VA max. To use the Clamp-On sensor, be sure to order the factory option 9602 AC/DC Clamp Input Unit. : ±0.1%max. : ±0.2%max. : ±0.1%max. : ±0.1%max. : ±1.0%max. : ±0.3%max. : ±0.3%max. : ±5.0%max. : ±2.0%max. : ±2.0%max. : ±5.0%max. : ±2.5%max. : ±1.5%max. : ±1.5%max. : ±30%max : ±30%max. : ±30%max. : ±30%max. : ±5.0%max. : ±30%max. : ±30%max. *For further details, please refer to the individual product catalog for the instrument. must be conducted at HIOKI for an additional service charge.
) : 9600, 9601, 9602 can be selected. distributor for clip type leads or other special needs. All information correct as of Apr. 30, 2015. All specifications are subject to change without notice. This file has been shared by a user of PDF Archive. Document ID: 00326473.